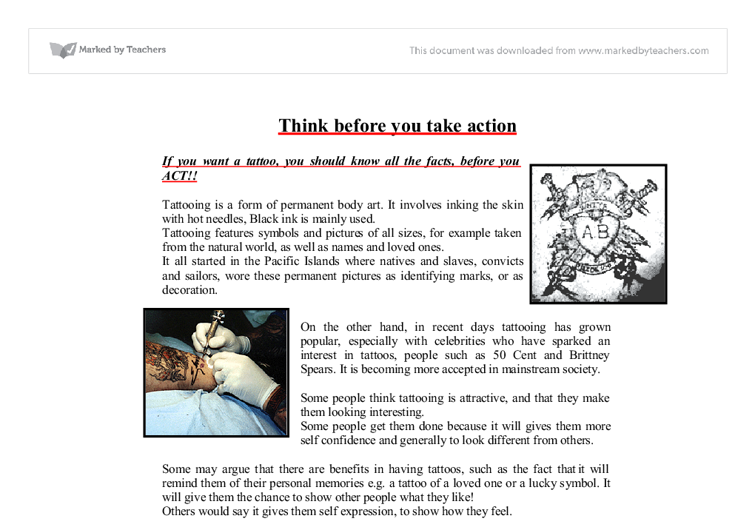 Think before you take action If you want a tattoo, you should know all the facts, before you ACT!! Tattooing is a form of permanent body art. It involves inking the skin with hot needles, Black ink is mainly used. Tattooing features symbols and pictures of all sizes, for example taken from the natural world, as well as names and loved ones. It all started in the Pacific Islands where natives and slaves, convicts and sailors, wore these permanent pictures as identifying marks, or as decoration. On the other hand, in recent days tattooing has grown popular, especially with celebrities who have sparked an interest in tattoos, people such as 50 Cent and Brittney Spears. ...read more. Other people may disagree, as they think while having a tattoo done, something might go wrong and it will cost a lot of money to fix with laser surgery. Several people from their own experience think as you get older, your body and the skin sag, and along with them your tattoo. Having a tattoo could create lost of opportunities, jobs and relationships for example. You might get your ex-partners name done and wouldn't be able to get it removed because of the inconvenience and cost causing perhaps an infection as a result. 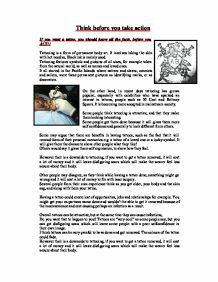 Overall tattoos can be attractive, but at the same time they can cause infections, Do you want that to happen to you? ...read more. Having a tattoo could create lost of opportunities, jobs and relationships for example. You might get your ex-partners name done and wouldn't be able to get it removed because of the inconvenience and cost causing perhaps an infection as a result. Overall tattoos can be attractive, but at the same time they can cause infections, Do you want that to happen to you? Tattoos are "very cool" as some people say, but you can get disfiguring scars which will leave some people with a poor self-confidence in their own image. I think tattoos can be very painful to have done and get removed. The colours of the tattoo could fade. SO MAKE YOU DECISION HARD AND CLEAR BEFORE YOU ACT.... . ?? ?? ?? ?? ...read more. Holden thinks, "He put my goddamn paper down and then looked at me like he'd just beaten the hell out of me in ping-pong or something. I don't think I'll ever forgive him for reading me that crap out loud...I'd only written that damn note so that he wouldn't feel too bad about flunking me." It seemed a mere book. Yet it was, I was to later find out, the black man's passport to existence." (Mathabane 17-18). The passes blacks were required to carry were difficult to keep in order, and officials made it more difficult than necessary. I partially agree with Mairs; disability is not a horrendous characteristic, and it is one people should not be afraid of. Because it is so common, the media should definitely be willing to show it. The media does have a strong influence on how people view minorities such as the disabled people. I expected to play well and play the way I know I can. All I can do is play my best that day. If my best that day doesn't get me holding the trophy and shooting a 63 then I need to work on my game a little bit and keep working at my mental state. Basically, rich people ruled and the poor could like it or lump it. As movies were discovered, movie stars inevitably followed. The followers of aristocrats died, and those people who were desperate for someone to deify, for the most part, switched their allegiance to the pretty faces of the twenties.